The weather last week was decidedly cooler (and wetter), so I turned to my favorite Spicy Black Bean soup recipe to warm things up – only this time I also added mushrooms. As a non-meat eater, I am in love with beans and mushrooms for their ability to thicken soups with rich flavor and texture. By pureeing most of the soup and then adding more beans, you get the best of both worlds…a creamy, earthy base with something to chew on. In a large pot add the broth, onion, pepper, celery, and mushrooms. Bring to a boil, then reduce heat and simmer for 10 minutes. Add half of the beans (or 1 can) and simmer for another 5 minutes. Puree the soup in a blender, food processor, etc. in batches or all at once if you can fit it. Return pureed soup to pot and add the rest of the beans and the seasonings. Allow to simmer for at least another 15 – 20 minutes, but we all know soup tastes better the longer it simmers and sits, so wait as long as you can! Soups are very forgiving so you can tweak the ingredients to suit your taste. I suggest enjoying a hot bowl with a pepper jack grilled cheese or seasonally-whimsical english muffin pizza (like I did with the help of a ghost cookie cutter). I also suggest wearing your pajamas and eating candy corn for dessert. This past weekend I managed to make 2 big check-marks on my Autumn List…the Keene Pumpkin Festival and apple picking. More on those soon, but I would love some suggestions for what to do with my apple supply. Galette? Crisp? Muffins? Sauce? This looks AWESOME. And I love that mini pumpkin in the corner. I just realized that you made the cheese into a ghost! Very clever Aimee. This soup sounds delicious. I am going to have to try making it soon! Healthy and satisfying, love it! 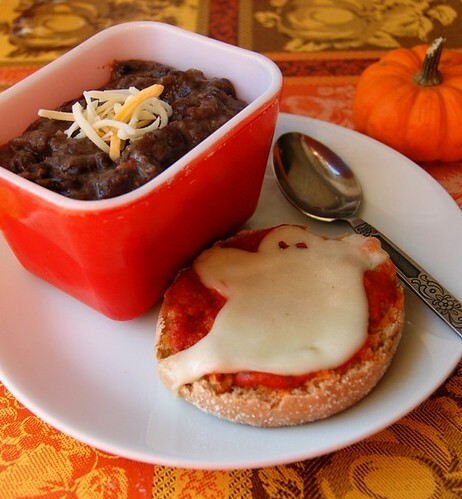 And really love the ghost cheese…hehee very festive! serve the apples with fondue….then you can just slice them up!